The next best thing to splashing in a waterfall is actually seeing one. A 15-foot waterfall is a sparkling treat for kids in the Brazilian Amazon exhibit by Burke Brothers Landscaping. This display also features “Rainbows in Flight,” including trained parrots and sun conures flying freely throughout the display, presented by the Philadelphia Zoo. Children love to dance, and this year they’ll sway to the music of Bollywood. Performances by dancers and musicians from India and Brazil happen on the Explorer’s Stage in the exhibition hall. Nourishing the soul and the stomach are two of the great joys of gardening. Kids learn how gardening can help people in the interactive Camden Children’s Garden display, inspired by “soup and salad” and the vegetable gardens that help feed Camden residents. In the PHS Village kids can learn first-hand how to create a home vegetable garden. 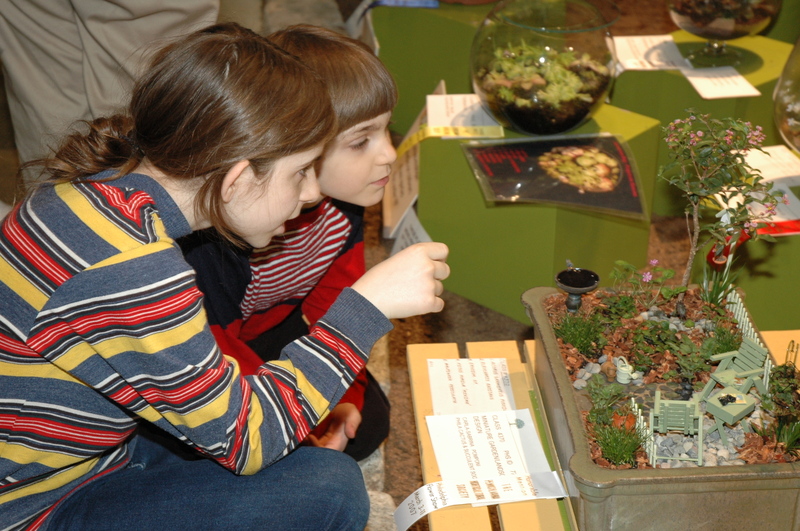 Children won’t want to miss the special youth entries (18 years and younger) in the intricate pressed plants category. The theme of this competition is Garden Friends. Also, look for animal topiaries; the weird and the wonderful winners in the plant competitions; and entries by local teens including Lower Merion High School’s front porch, Abington Senior High School’s front porch, Harrington High School’s window box, and Lower Cape May Regional High School’s “succulent scene” window box. When it’s time to play, take a break in the enjoyable Family Lounge for parents and toddlers. Open daily from 10 a.m. to 5 p.m., the Family Lounge is located just outside the Show exhibition halls in Room 203. The folks from Fisher Price ® are on hand this year to hand out goody bags, play games, and provide play areas in the Lounge. Children must be accompanied by adults. If you plan to capture all the fun in photographs, camera batteries and disposable cameras are available for sale at the official Flower Show Shoppe in the center of the exhibition halls. There’s also a special DVD of the 2010 Show, along with keepsakes for the whole family. Attention Girl Scouts! If your child is a Girl Scout who is 17 years of age or younger and comes to the Show in her Scout uniform on Sunday, March 7, she will be admitted to the Show for $7. Girl Scouts Day at the Show is a time to celebrate the achievements of Scouts who have participated in the new Pennsylvania Horticultural Society patch program, “Planting Seeds, Growing Lives.” Girl Scouts Day tickets are available on Sunday, March 7 only at the Show Box Office. This entry was posted on January 28, 2010 at 11:56 am and is filed under 2010 Flower Show - Passport to the World, Attractions, Behind-the-Scenes, Deals, Family-Friendly, Shopping, Sponsors, Visitor Tips. You can follow any responses to this entry through the RSS 2.0 feed. You can leave a response, or trackback from your own site.